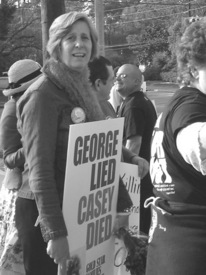 Cindy Sheehan. Photo by paul Hill/PWW. HOUSTON — On Feb. 6, President’s Day, some 200 supporters joined peace activist Cindy Sheehan in front of St. Martin’s Episcopal Church, claimed by Barbara Bush and former President George H. W. Bush as their home church. The event, in one of Houston’s wealthiest neighborhoods, was organized by Gold Star Families for Peace, Veterans for Peace and Code Pink.